From the curator, Kerrie Conover:This event is going to be hosted on the same night as Fort Worth Gallery Night. If you don't know what that is, it is an evening hosted by the Fort Worth Art Dealers Association, in which many galleries and museums in Fort Worth (as well as UTA, Arlington Museum of Art) have their doors open to the public for free admission into the space for exhibitions. Thousands of people come out and "gallery hop" from place to place. This year, F6 will be listed as a "Friend of the Art Dealer's Association" in the Gallery Night brochure, that is exposed to the masses, and hopefully published as well in the Star-Telegram, Arlington Paper, FW Weekly, and Dallas Observer. 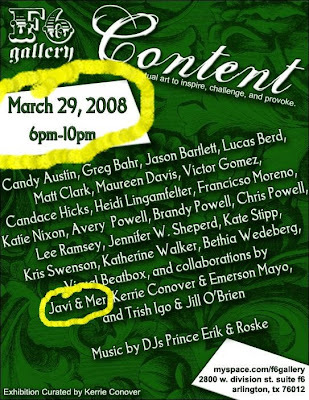 My good friend Mer and I will be doing a live art composition during this event. Please feel welcome to come out and check us out. Do You Dress Like This?